My single biggest disappointment about writing Five Star Trails Flagstaff and Sedona was that I could not include the Inner Basin Trail #29. I was literally driving up there on [date] to set up camp at Lockett Meadow, and hike that trail the next morning, when I had to turn around. They had closed AZ 89 north of Flagstaff due to the smoke from what would become the Schultz Fire. Area affected by the 2010 Schultz Fire. The Inner Basin is under the key. 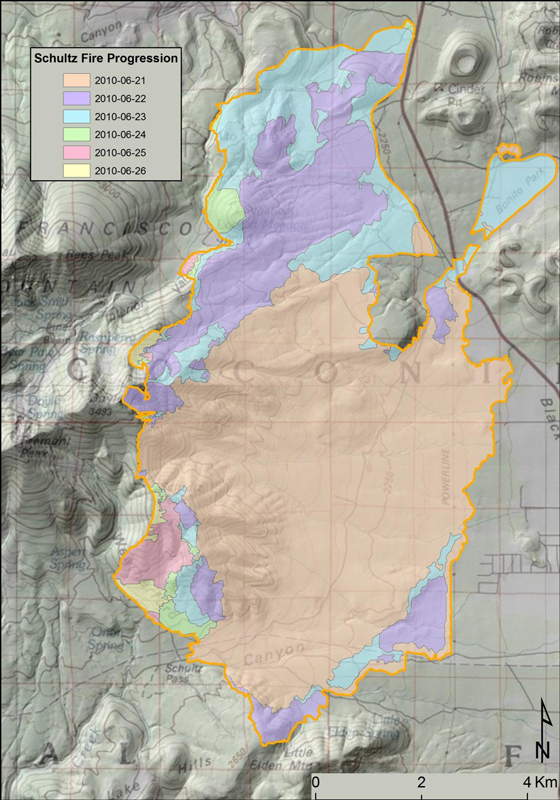 Even after that fire was finally out, Lockett Meadow had been trashed by use as a staging area for the firefighters, and was closed for a year to be rehabbed. By the time that was complete, I was already past deadline. I finally had another chance this August. The brief hike description below lacks the sort of detail and documentation you’d find in my book, because, to be honest, I don’t go out equipped to take those kind of note anymore. I hike for fun now. But I will share what I remember. UPDATE: I can copy URL’s from my own blog…. 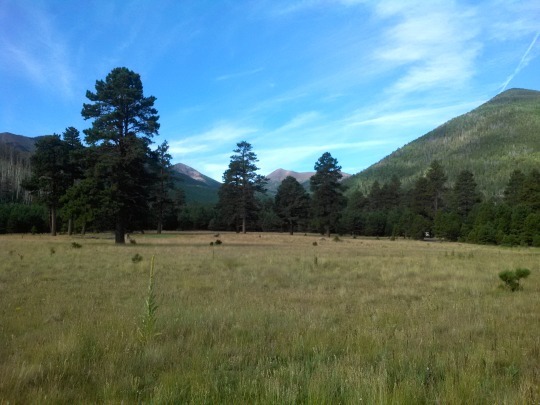 Inner Basin Train starts from the Lockett Meadow Campground north of Flagstaff. Lockett Meadow campsites require a fee, but trailhead parking is free. You should know, though, that you are starting – starting – at 8900’ above sea level, and it only goes up from there. The tall grass of Lockett Meadow grows over a shelf made by a collapsed section of the caldera wall of the San Francisco Peaks. The SF peaks are remnants of a much taller single volcano that erupted catastrophically millions of years ago. The Coconino Plateau sits over a magma plume. That’s why the springs are sometimes hot, and the hills are covered with lava rock. 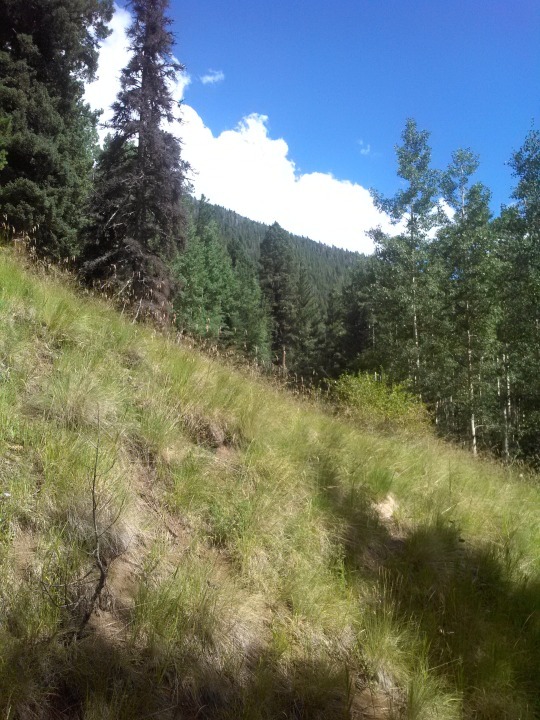 The first part is a climb through spruce and pine forest, skirting the farthest advance of the Schultz fire. Do not despair, for you soon climb past all of that, as the dirt single-track now winds and switches back through a huge stand of aspen trees. 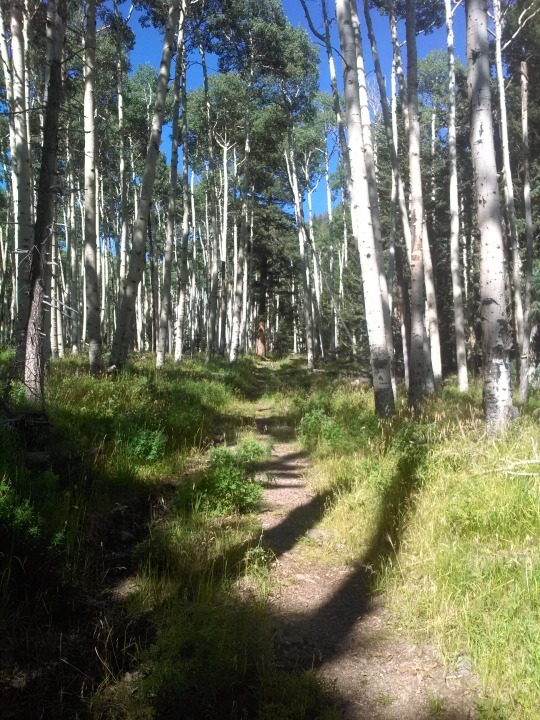 Seriously, if you believe that you cannot possibly get enough of towering, trembling white aspens all around you, this trail will test that notion. The trail evens out, and the aspen surrender to the spruce again, when the trail joins Waterline Road. This road, which circumnavigates the northern slopes of the Peaks, was built and maintained for utility vehicles to service the water pumps on the slopes, and in the basin. These facilities provide Flagstaff with much of its water. The road keeps winding up the mountain to a large pump station, where signs will explain this. This is where most of the local hikers – who can be numerous on weekends with good weather, turn around. If this were for the book, I’d tell you this is the turn-around for the Easy version of the hike. There is a spring at the place, water dripping out of a pipe, and another sign warns you that it is not treated in any way. This water has not, however, drained through cattle country, which is the source of the most common contaminants and parasites that make stream water perilous in these parts. So it would be reasonably safe. But it tastes just like the pipe. From here, you can follow Waterline Road east then south (ish)and down towards Schultz pass (where the fire started). Or you can follow it around west then north(ish) over towards its junction with the Bear Jaw and Abineau trails (which I covered in the book). Or you can keep going south-ish, and definitely up towards the basin. The road rounds steep, grass covered hills until the broad meadow of the Inner Basin opens up. Following the road through the tall grass and intermittent stands of spruce trees brings you to another water pump station. It was pumping along loud enough when I arrived that I had to shout to my son six feet away. That’s not always the case, happily. This is the turn-around for the medium hike. You are about three miles from the campground at this point. The road past that, further south and further up,, degenerating into rocky single-track as the forest of Christmas trees mostly Engleman fir trees, close in around it. It follows a steep ravine towards the edge of the Caldera, roughly beneath the shadow of Aggassiz Peak. If you were to keep climbing (and I confess that we did not) the trail will wind and then switch back until it terminates at its intersection with the Weatherford Trail (also in my book) just below the tree-line. That’s the hard hike. Now, because you got this far, here’s the secret hike. There is a closed road off to the side of the main trailhead. You cannot drive upon it. The gate is closed, and it’s choked by deadfall after a quarter mile in any case. But you can hike it. The road parallels the trail, though pines and then aspen, only a little more direct, and a lot more secluded. On a Saturday afternoon, I has the road to myself to the point where I was worried about bears. Oh yeah – the Peaks have some black bears. They are shy – which is why they’re still around to be honest – but this place was isolated enough that I could imagine encountering them. I didn’t. After two miles or so (I wasn’t prepared to accurately mark the mileage) I heard voices. The Secret Road intersects with the Waterline trail near that same pump station with the spring. I returned the way I came. My map generating skills aren’t what they used to be either.